Last week I had the opportunity to visit an icon, but not the kind you might be imagining. I didn’t meet any queens or bump into Bill Cosby. This icon was actually a place and a quite infamous one at that. It was a visit that required some history lessons beforehand and lots of contemplation afterwards. Last week I stood on a mass grave at the Auschwitz-Birkenau Extermination camp. You may have heard of it. It’s an instantly recognizable name and site. The sign is German for “Work will set you free” and it was one among many of underhanded jabs from the Nazis to their victims. Work here wouldn’t set anyone free. It would kill them in an average of 2 months–an amazingly short, but painfully long, amount of time. In this photo my classmates are about to enter Auschwitz I, where most political prisoners, namely Polish Communists, were kept. 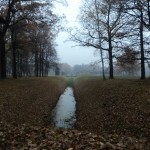 Jews and those destined for the immediate gassing were sent down the road to Birkenau. It is there that most people associate the most horrible atrocities and most systematic killings of the Holocaust. It is difficult to explain how being in a labor or extermination camp makes you feel. I made the decision to go with the hope that I would leave with a clearer, more realistic picture of genocide. I left even more constricted by shock, awe and disbelief of the atrocities. A week later, my head is still spinning as I try to process and retain everything I took in on that foggy day in Poland. 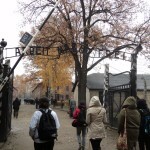 To add to my own confusion, our experiences at these two sites (Auschwitz and Birkenau) were remarkably different. 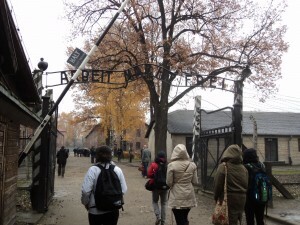 Despite what any guide will (and did) tell us, Auschwitz is a tourist attraction. I would venture to call it the largest in Poland, with 1.4 million visitors every year. Tour busses, crowds and hasty guides made it impossible to find solitude or space for reflection in the camp-turned-museum. Because of the number of visitors, museum-employed guides are mandatory. This allows them to control how long visitors stay in the camp and determine exactly what story gets told during a visit to Auschwitz. Who can blame them? The Poles want their voices and struggles heard, besides, they are responsible for a large part of the upkeep of the camps. Thankfully, Auschwitz is not a camp anymore. Unfortunately, however, its status as a memorial is over too. 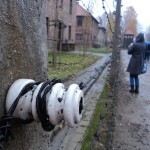 Auschwitz I is a museum that has become another notch on the itinerary of every tourist in Poland. 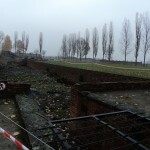 In Birkenau the situation was very different. There was no formal entrance, no guides, few signs and even fewer visitors. Without our very knowledgeable professor all we would have seen would be barbed wire and the foundations of old buildings. He pointed out to us where prisoners would have slept, worked digging out trenches in the bitter cold, and had their heads shaved upon arrival. He showed us where an experimental gas chamber once killed a group over the period of several days. Then he led us to the stairway where thousands were systematically gassed everyday. He told us to examine the grass in an open field and confirmed that the small white “pebbles” we kept finding were actually pieces of bone. It was the type of sight I will never forget and one that I hope I can convey to others, so that even if it does become a tourist-filled museum the meaning and purpose will never be lost. With one glimpse, everyone should know what they’re seeing—an icon, if you will.